Size 8/10 - $40.99 Only 8 left! Size 10/12 - $40.99 12/14 - $40.99 Only 5 left! If we've learned anything from books and movies about living in futuristic dystopian societies, it's that you never know when you'll get sucked into a huge, high-stakes competition over scarce resources. 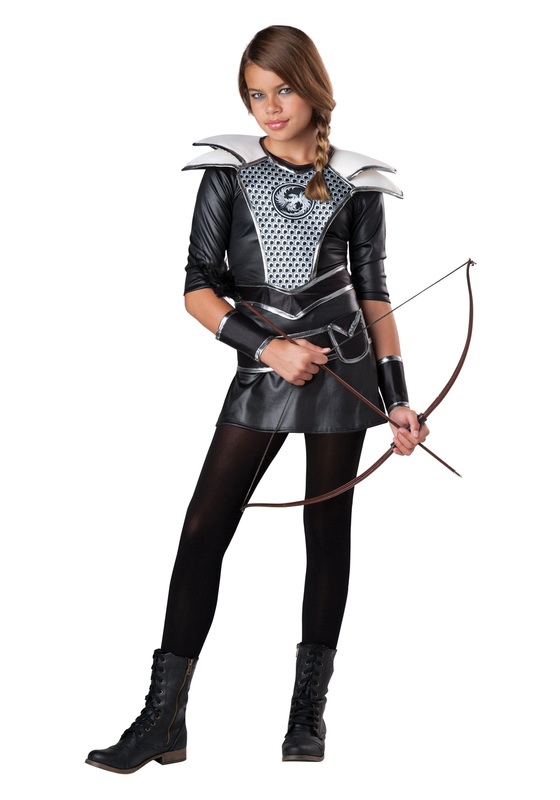 It doesn't hurt to get as much practice for these situations as you can, and donning this fierce Midnight Huntress Costume during your training will help you be at the top of your game! Even though fighting against contestants from other clans (or whatever they call “towns” in the future) for some extra food or supplies sounds like a pretty bad idea for everyone, it's actually a great way to get their hands on some really awesome gear! Goodies like armor, hi-tech weapons, and any fancy government-issued equipment are always scattered all over the place in these games. But, why risk bothering with some fancy weapons that can break down when you can grab a reliable bow and arrow to use in a fight? That way, you can be quick, stealthy, and you can practice your archery skills ahead of time. Plus, not many competitors seem to used these ancient-style weapons in the future, so think of how cool you'll look when you win the contest using only your trusty bow and your wits! You'll look especially cool when you win in this sporty, futuristic tunic. It features attached, fierce looking shoulder pads, and a matching utility belt and set of arm gauntlets, to help protect you and give you an edge in the heat of battle. Add a bow, and some tactical boots and leggings to complete this style, and you'll look ready for victory!